Gender plays a pivotal role in the Market Development Programme for Northern Ghana (MADE). Ghana MADE does not only support women’s economic empowerment, but economic empowerment for all – a concept that necessitates the active participation of women in wage earning agricultural activities. 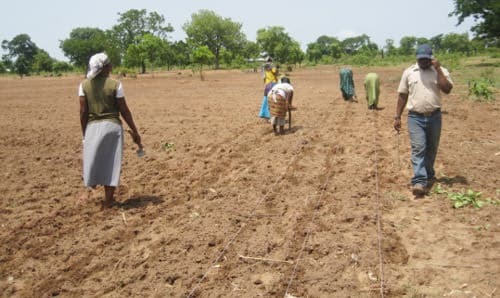 Low productivity and market failures for agricultural outputs are the main sources of poverty in Ghana’s Northern regions, where women encounter greater difficulties than men in engaging in income generating opportunities. Indeed, as is often the case, women in the MADE project areas are more likely to engage in unpaid activities, such as house chores and providing labour in their husbands’ or parents’ farm. All in all, a precarious access to land, combined with an overburden of house chores and limited access to agricultural inputs due to lack of access to finance, hamper women’s capacity to engage in income-generating activities and limits their ability to access education and skills services that can enhance their economic prospects. Are interested and successful in engaging in market development activities. Despite heavy constraints, in the onion market rainy season adaptation trials, one out of nine lead farmers selected to lead the trials was female; as was one out of five input dealers supporting the trials. 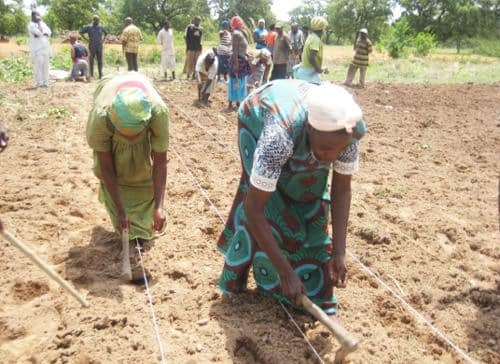 GAP demonstrations on rainy and dry season production were also mounted, providing training to 629 female farmers; and four of the 15 agricultural extension agents who were trained to roll-out the demonstrations were female. In tomatoes, 23% of farmers trained on GAP were female. Are more likely to be early adopters, and follow through recommendations made at the demonstrations. In the groundnut market for instance, 30% of female farmers attended the field days where GAP was demonstrated. Over half of these female farmers later adopted GAP in their own fields. Are better at paying back loans facilitated by an aggregator. For instance, of the over 1500 farmers given inputs credit by MADE’s partner aggregator, all the 700 female farmers supported paid back 100% of the loans. Women’s access to agricultural production inputs, information and good agronomic practices (GAP), which have proven successful. Women producers’ linkages to networks, through facilitating the creation of women groups where they can share experiences, and have better access to inputs and support services. Women producers’ access to markets, an initiative supported, for instance, by Eden Tree – a large supplier of vegetables in Accra. Access to BDS and finance for women traders and processors, which will be launched in Year 2 of the MADE programme.